Robert Louis Stevenson, on his travels in the Pacific, hated the sea and liked islands. He wrote in 1888 that sailing the sea was “stupefying to the mind and poisonous to the temper … but you are amply repaid when you sight an island and drop anchor in a new world”. Dropping anchor on a cruise ship may not appeal to all but it is not just ‘plain sailing’. There is always something to feast upon. I stopped at different spots regularly enough to make each day new. It’s true that for a European the South Pacific is a long, long way but the pressure is off instantly on landing; the airport in Tahiti as its marina are sparingly near to each other. 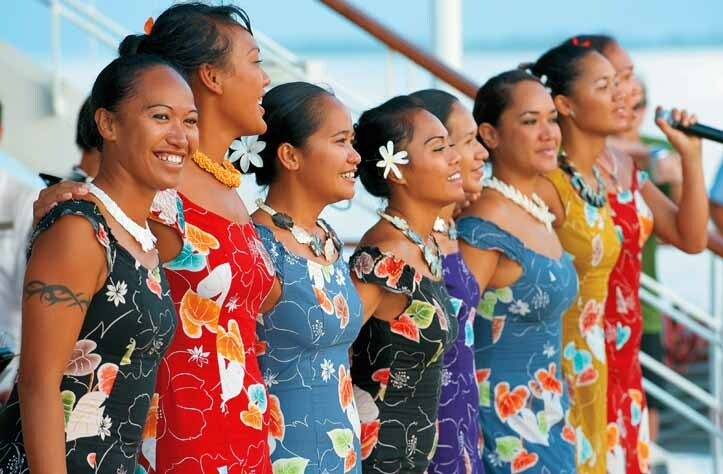 I experienced the high-end of cruise ships in the South Pacific with Paul Gauguin Cruises. The overall level of service and style is impressive with even an original Paul Gauguin sketch on board, donated by his family: such is the strength of connection with the ship’s title. The crew (216 in all to look after 320 guests) are drawn mainly from a variety of the local islands, which gives them authenticity and a pleasing reassurance. Tahitians have been renowned since Gauguin’s day for their sensual beauty, so who better to have the job of meeting and greeting than a hand-picked bevy? The clientele are predominantly American, coming via Los Angeles although a notable fraction of the world’s French speakers enjoy the familiarity of the Tricoleur. Travel companies have become alert to realizing the extent to which food plays an essential part in the mix of an outstanding holiday. My palate was treated to dishes as varied as thecolours on Gauguin’s palette, with fresh produce and round-the-clock room service. The restaurants were diverse in their menus with fresh fish naturally prevalent and favourites such as Spice crusted Tahitian yellow fin tuna medallions and Grilled moon fish. As with the size of the vessel, so with the amenities. There is plenty to enjoy on what would is effectively a 5-star hotel, although gambling and slot machines appealed to a worrying number in preference to traditional Polynesian dancing on offer further down the deck. There is so much available in terms of sea-based activities and excursions with snorkelling, hiking, aquabikes and even swimming with friendly stingrays. I got my cultural fix by listening to a lecturer on Polynesia, others got theirs by going on a botanical and agricultural walk. For once the brochure doesn’t lie. Nor do the pictures need airbrushing. In visiting French Polynesia I was being granted a rare treat, not just a holiday. These are stunning volcanic islands, set against the foreboding spirit of the Pacific Ocean, with their dramatic surging peaks. They have a wonderful prospect, and a seemingly gothic structure when seen from the vessel. There is something reverential about the serenity of the lush green-capped mountain tops and at night one is virtually guaranteed the full spangling array of the stars. This is the region that brought to the world the notion of taboo and tattoos. The islanders believe in the power (mana) of their ancestors and feel they are simply stewards of the land that they see as belonging to their Gods. This seven-night trip has been cleverly construed with a schedule that is paced to allow for recovery from the flight, and adjustment to the time difference and climate. The first two days act as a gentle aperitif for what is to come. I stepped off on day one at Hauhine to enjoy a restorative day, plucking mangos from their tree to eat and swimming in the crystal-blue waters. Tahaa was the second stop with a gorgeous trip to an islet (motu). 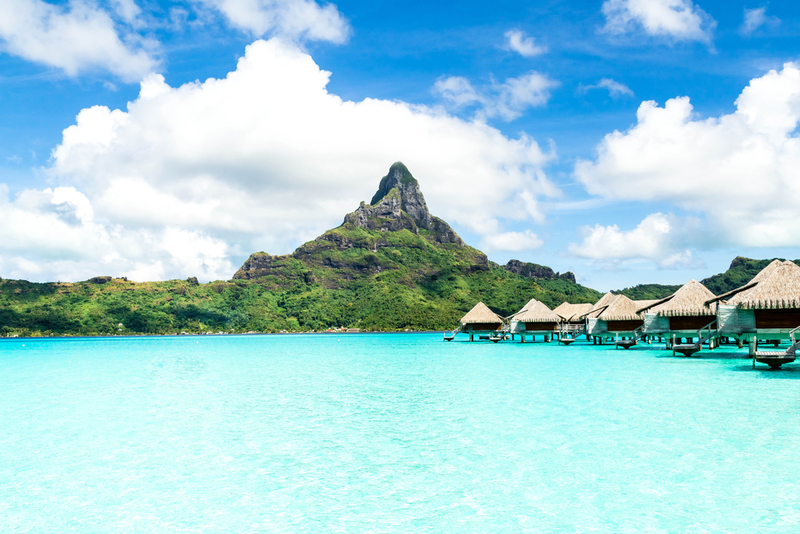 Then came Bora Bora, world-famous for its amazing shape – with a steep peak surrounded by a ring of motus. Though overtly touristic and very territorial with its private beaches, nonetheless cruising is a relatively economic way of visiting this sceptered isle. On land, an hotel of similar standard to the vessel would cost an arm and a leg. 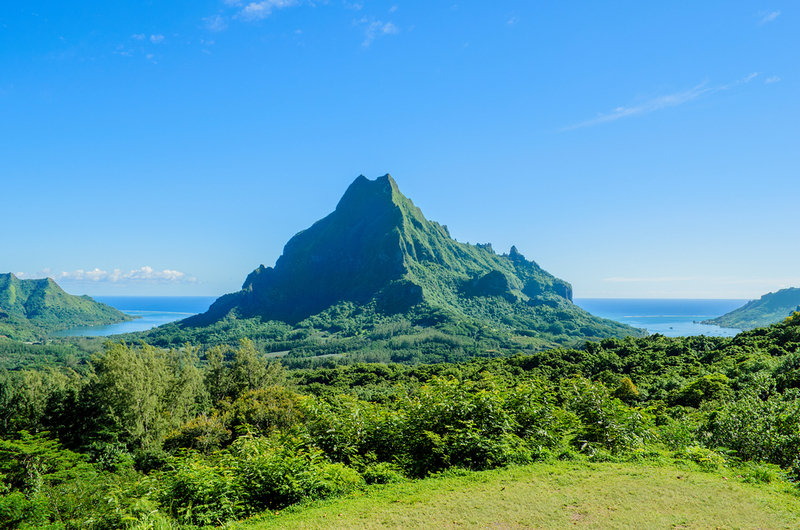 While Bora Bora is special for its extraordinary array of shades of blue water, Moorea is just as special for its shades of green land. I felt so excited in waking up at dawn to see the boat approaching the island. God has a sense of paradise though even there he taunts us with mosquitos! Tahiti itself has as a former name for the island “Tahiti-nui-i-te-vai-urirau”, meaning “Great Tahiti of the many-coloured waters”. I picked up a Tahitian-to-English dictionary and found words that exemplified this most exotic of locations. Aina – the skin of the armpits when of a dark colour – was something I developed and aruriri – a sea that in breaking sends up its sprays towards the clouds – was something I witnessed but luckily I didn’t suffer from iriaa – the skin peeling off a person after being sun burnt, or feel the need to neeneetapuahi – to crawl by an oven of food. The author Austin Coates, in his book, Islands of the South, tells of wandering Polynesians avoiding large, mountainous islands, preferring smaller, more isolated atolls. “In the framework of an ocean civilisation, these dots were the centres, mountainous islands the periphery”. I am not sure those, like me, who set eyes upon the jewels of Bora Bora and Moorea, would necessarily agree.